Last year as part of my New Year's intentions I started making my own chicken stock. I like to call them intentions because I feel like that's more realistic than resolutions. They can be more vague while still setting goals, ya know? Anyway, I wanted to be more a more resourceful cook so I decided I would start by making my own chicken stock. After I made my own chicken stock I have been hooked on making my own ever since. I try to keep our freezer stocked with stock so we always have some ready. I love using chicken stock instead of water when cooking rice, and chicken stock is called for in so many dinner recipes we make, its great to not have to worry about buying it. Homemade chicken stock is so much tastier than the store-bought. I've been making my own for over a year now and I still am in love with it. Plus, it's so easy! Stock is really rather forgiving in terms of ingredients. You don't necessarily need a strict recipe to follow, and can improvise depending on what you have on hand. The basic ingredients are: carrots, celery, onions, chicken, and spices. I typically use thyme, parsley, salt, pepper, and a bay leaf. There is definitely room to adjust accordingly! I've put together instructions for making chicken stock on the stove AND for how to make chicken stock in the instant pot (pressure cooker)! I wash and roughly chop the vegetables. You don't need to worry about dicing them up. Here I used the carcass from a roasted chicken I made the night before. Whenever we have chicken bones from a roast chicken or buying a rotisserie chicken, I always save the bones in the freezer for stock! Just the other night I left my friends house with the chicken carcass she was going to throw out because I wanted to save it for stock... Yes, I'm that friend! After simmering for an hour, the stock is ready to be strained! You can skim the fat while it's cooking, wait until after it cools, or just leave it in there. I like to keep a bag in the freezer of vegetable scraps to use in stock. You don't need whole carrots, onions, and celery. Whenever I peel carrots, I stick the peels in the bag. Anytime I chop onions, I save the ends and the skin in my freezer bag. The tops of carrots, celery, etc., always goes in the bag! When it's time to make stock I dump the whole bag of scraps in the pot. Each one of those scraps has flavor and can contribute to your stock, so I like to save them and use them later so I am not wasting any of it! It may not be fit for your pasta dish, but it's perfect for stock. Also, try making stock ice cubes! They're perfect for small additions to dishes when you just need a tablespoon or two of liquid. To make the chicken stock in the instant pot (or pressure cooker), the protocol is fairly similar. You add the chicken bones/carcass, add the vegetables on top, add spices, and pour the water over it all. My instant pot is a duo mini, which only holds 6 cups of water max. After all the solids, I can usually fit about 4-5 cups of water (only going to the max fill line). I pressure cook it for one hour. Something I just recently learned is that you can reuse the bones and make stock from the same bones multiple times! So when I make stock in the instant pot, I will strain the stock out, and add another 4 cups of water to make a second (and third) batch using the same bones and vegetables. It's awesome! I even have a batch cooking right now. Well, that's it. I hope I've inspired you to try making your own chicken stock! 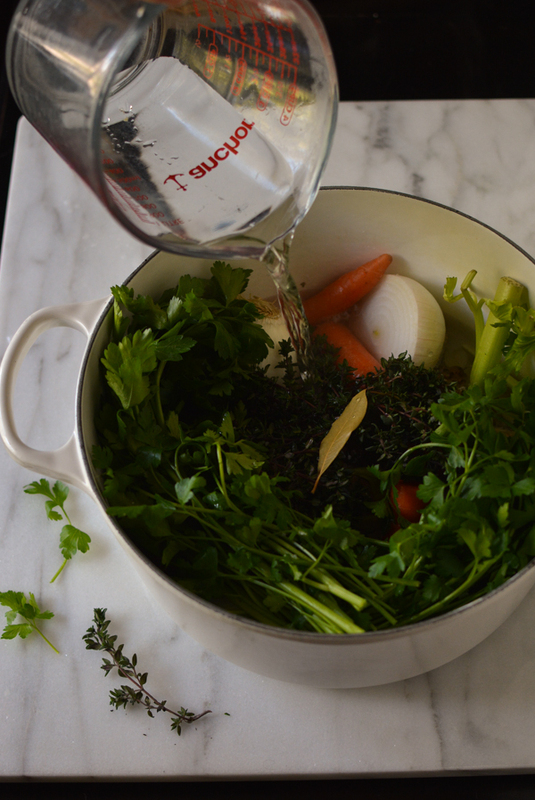 Homemade chicken stock that is simple and sure to become a staple in your cooking. 1. To a large pot or dutch oven, add the chicken bones. 2. Add washed and roughly chopped vegetables. 3. Add herbs, and spices. 4. Pour the 8 cups of water on top, and bring the pot to a boil. 5. After reaching a boil, reduce heat and let it simmer for 1 hour. * You can use a ladel to skim the fat durring this process, as the fat will form beads on top of the water. 6. After 1 hour (you can let it continue for longer if preferred), strain the stock through a fine mesh sieve into storage containers. Let cool, and store in the refrigerator for 1 week or in the freezer. Homemade chicken stock made in the Instant Pot (pressure cooker) that is simple and sure to become a staple in your cooking. 1. Add chicken bones to the pot of the pressure cooker. 2. Wash and roughly chop the vegetables, layering them on top of the chicken bones. Fill as much as you can fit into your sized pressure cooker. 3. Add herbs and spices. 4. Pour water on top, filling only to your maximum fill line (I have the Duo Mini which only holds 6 cups). 5. Close lid, put the steam valve to "sealing". 6. Press "Manual" or "Pressure Cook", and set the time to 1 hour. 7. After the pressure cooker has finished the 1 hour, use the manual steam release to release pressure before opening. 8. Strain the stock through a fine mesh sieve and allow to cool. 9. Store in the refrigerator for 1 week or in the freezer for long term. *Note, I will reuse the same stock ingredients and make 3 batches of stock total in the intsant pot. After straining, add the solids back to the pot, add more water, and run it again. I repeat twice and get really delicious concentrated stock all three times!